I don’t know about what goes on or if/how you celebrate this amazing holiday in your house but Easter is one of my favorite holidays because it is a time that helps me focus and reflect on the life of our Savior Jesus Christ and all he sacrificed for us. Through this trial that my family has been going through the last month, we have relied heavily upon our Savior to help comfort, bless and guide us through these hard times. I am so grateful for Him, that He died to save us all, and that he was resurrected that we might be one day, too. Another reason I love Easter is for all the bright spring colors. It was always tradition in my house, and now in my own family, that all the girls got cute new Easter dresses and all the boys got cute new Easter church outfits. I love the bright colors! The third reason, and definitely not the last reason- just the last I am going to talk about, is that I love Easter because of Cadbury Mini Eggs! MMM! I stash up on these wonderful chocolate eggs! Even after Easter comes and goes, I have bags left over. So if you are looking for a DELICIOUS Easter Sunday treat, or in the next coming weeks if you are looking for a way to use up some of those extra Cadbury Mini Eggs, then this is the PERFECT recipe for you! My husband raved about these! My whole family gobbled them up! Definitely put this recipe on your “to-make” list! You are going to love them, too! Melt butter over medium heat. Once melted add to the bowl of your electric mixer. Cream together with sugars. Spread batter into a greased 8×8, 9×9, or 11×7 baking dish. Happy Easter! Your blondies look super yummy! I didn't get any chocolate for Easter this year! :( So I think I will make your blondies this afternoon! Yum! I'm going to try with Easter m&m's... Love Cadbury chocolate eggs, but the corner store was out!! My husband literaly savors each and every Cadbury Mini Egg that I bring into this house! He'd love these! I'd like to invite you to stop by Sweet & Simple Sunday! !http://cupsbykim.blogspot.com/2012/04/sweet-simple-sunday-4.htmlHope to see you there! LOVE mini eggs! 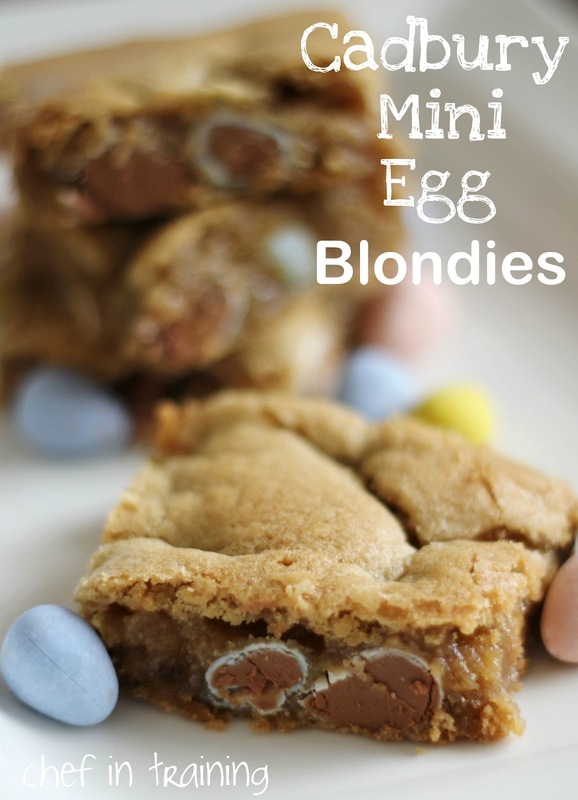 AND Blondies!Sounds heavenly - on my to make soon list! They look yummy. Yes I love the colors of Easter too. Hope you had a great day! Oh how I'd love to bite into those. That's so much better than plain chocolate chips. Hey! Just made these! in the oven now... just wanted to mention that in the first line of the directions it reads " sift the flowers, baking soda and salt." i think it should be sugars instead of flowers? haha it worked our either way! These look delicious! Can't wait to try... Quick question though, do I put the mini eggs in whole or crush them up before you fold them in? Thanks! Hub and I just finished sampling the batch of these that I whipped up. Sooooo good! I used 1 tsp of vanilla instead of 1 Tbsp. I would think a tablespoon overpowering. Made these this weekend for my family that was in town, the pan was gone in one day. So good! These look so good! I just made some, but the dough was really sticky. They are baking now and not coming out right. I did the 8x8 pan and I think it's too much dough for it. Bummer! Ok, for sure I needed a bigger dish. These were like 2" thick. LOL! I had to cook them a long time to get the middle done. That left them overcooked. However, there were still good, but dry. I will put them in a 9x13 next time. I made these for a family get-together today. They were a huge hit. They will definitely be part of my regular Easter goodie-making! Just made in a 9x13 pan and baked for 15 minutes......Perfect! I am going to make these tomorrow! I can't wait!! Thanks for sharing!! I will link back to you of course if I post the recipe. These look delicious! I just made these--oh my goodness!! They are delish! Such a great Blondie recipe. Thanks for posting!